The Creative Crossing: N.C.M #1 - Iron Man Outfits! I'm addicted to Iron Man. 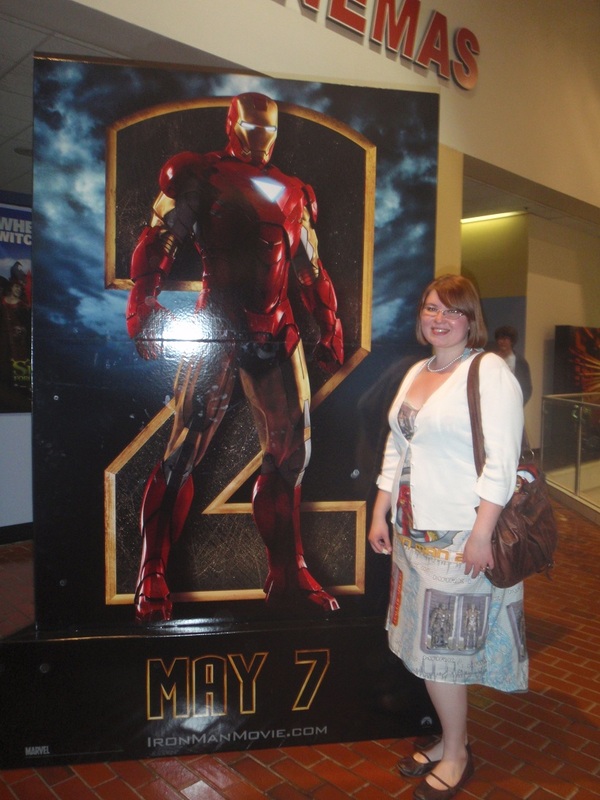 I saw the first Iron Man movie 5 times in the theater and pre-ordered a copy of the DVD (it remains the only thing I've ever pre-ordered.) And when I heard that the second Iron Man movie was coming out, I freaked out with joy. And, being typical Cynthia, I decided I had to make something to wear to Iron Man 2... two weeks before it was coming out. I told my hubby and we decided I should make him something. And when some friends of ours wanted to come, I of course had to make something for them as well. I wanted something fun, but something we could wear again, so costumes were out of the idea (I would never attempt to make an Iron Man costume in two weeks... probably.). 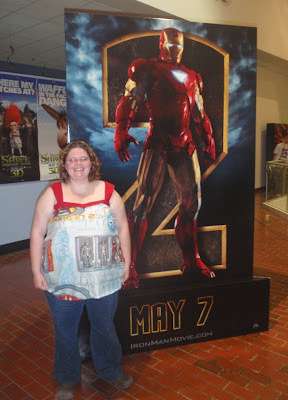 So I went searching for Iron Man printed fabric. Guess how much I found. Ziltch. Zip. Nada. Nothing. So then a thought occurred. Bedsheets! Don't laugh! Bedsheets are a great way to make cheap clothing! I bought an Iron Man set at Target and began the work. I wanted a dress and I wanted something that was kinda retro-y. It's a halter top, under the bust style. I found a tutorial for what the creator called a Dragon Dress on Craftster. I used the tutorial for the bodice, but made my own pattern for the rest of the dress. I thought that it would be kinda fun to have a small train in the back, but I don't think it was such a good idea now and I'll probably end up changing that. Hubby and I decided to make him a button down shirt, and I won't lie, I was dreading it. I had never made a button down shirt before. I used McCalls #2447 and was thrilled with the whole process! The pattern was very easy to understand and use and it felt like I blew through it. Hubby loved the shirt and still wears it a year later. I also made a bandanna for Lynn's husband, but alas, I could not find a picture of it. I was especially proud of these because they turned out so well in such a short amount of time. And for those of you who are frugal like me, all four projects together cost only $22.